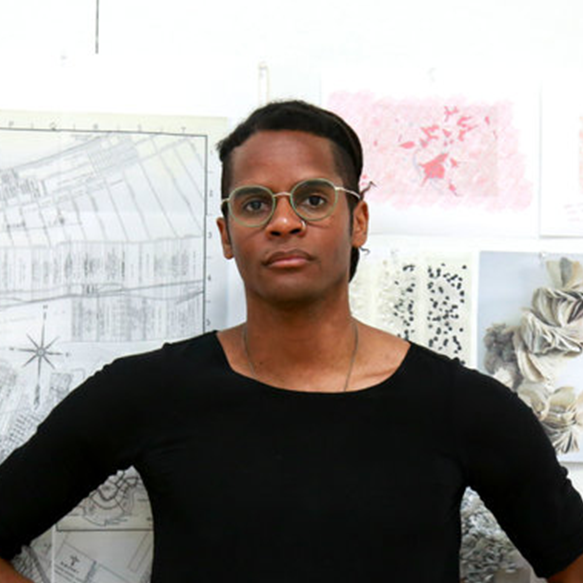 Ron Morrison [Elegant Collisions] is an interdisciplinary designer, artist, and researcher working across the fields of human geography, digital technology, and urbanism. Their practice works to investigate the generative ways in which the unassimilable refigures, complicates, and dissolves our understandings of race + geographic space as fixed and knowable. Focusing on boundaries, subjectivity, and protection they look for the ways that fissures and inconsistencies can allow for emergent moments to practice new spatial relationships and epistemologies. From these seemingly dissonant spaces we learn to rework and retune systems towards an increased potential for collaboration and action, from the quotidian to the phenomenological. With a strong background in community development and social advocacy, they believe that people should have full access to shaping their cities and communities and see design as a medium for creating knowledge and moving beyond paralysis in the face of complexity. From building open source platforms to upend the continued practice of solitary confinement to crafting community based archives to combat gentrification, their work investigates cartographies of slow violence, cybernetics, unassimilable data, and blackness. Ron is interested in what happens when we consider the radical potential held within everyday materials? Their current research + artistic practice look at various historic and diasporic technologies that black people have used to signify and encode sanctuary within hostile spaces. Focusing on mobility and absence, Ron is concerned with residual data articulated through everyday objects left behind in the aftermath of movement. This talk hopes to highlight some of the limitations of using geospatial data to redress racialized violence within urban landscapes and points to the need for embodied practices that yield different spatial imaginaries.